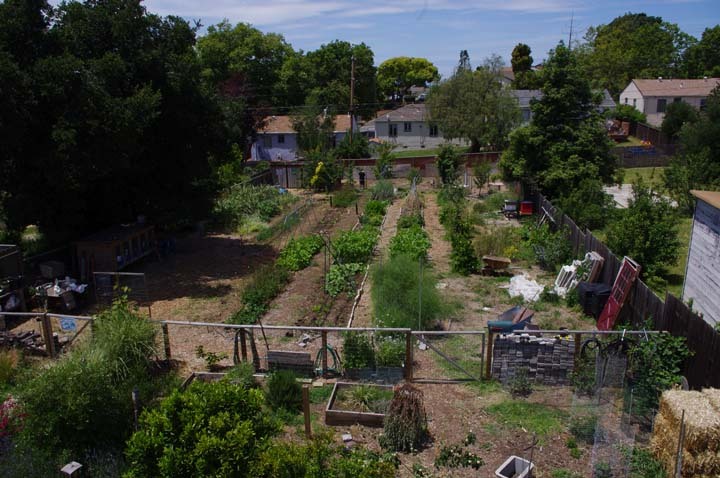 Dog Island Farm is an urban farm located in the San Francisco Bay Area. We have a mild Mediterranean Climate with wet, cool winters and dry, warm summers. The farm is located close to the San Francisco Bay, which moderates our temperatures with its marine influence. We were fortunate to find a large residential parcel in the city – just over 1/4 acre. The house is a small 2bd/1ba single story built in the 1950s. The lot was originally a fruit orchard (our next door neighbors own the original farmhouse) that was then subdivided. Our lot got the old well and associated water tower. We got the well working but were disappointed when we found out that due to heavy agricultural use, the well had saltwater intrusion from the bay. The previous owners, however, had converted the old water tower into a loft apartment of sorts. Nothing about it is legal, however, so we won’t be renting it out anytime soon. What we started with (pay attention to the little tree on the right)Photo taken January 2009 from back porch. When we bought the lot there were several very pooly maintained fruit trees, overgrown vinca, a large row of artichokes, lots of junk and our own colony of yellow jackets. We removed the yellow jackets by force, and basically tore out all the trees and overgrown plants except for a small citrus tree (seen above on the right) and the artichokes. It looked really bad but we thought maybe we could save it. I don’t feel bad for tearing out the trees since we replaced the half dozen we took out with 24 new fruit trees and 2 olive trees. First things first, we dug our vegetable garden beds and immediately started planting. We then put in a large patio, some landscaping and various other things. The citrus tree came back with a vengeance. It’s amazing what a little TLC can do. That poor little citrus tree is here ^. It is now covered in oranges every season. Love this overhead shot so much! I would love to see an updated photo on the over head picture. Right now there’s not a whole lot going on. And someone is now living in the water tower so I don’t have free access to that balcony right now. This overhead shot was taken this past June. Very inspiring! So cool you’re in Vallejo. 🙂 I just found you, Neighbor, & can’t wait to check your your archives. When you two are holding up the rainbow chard to the camera it made me think of a modern day American Gothic. Thanks for sharing your lives. I wish the best to you folks. I am sure you are no stranger to this Award, but I absolutely love your blog and I want to nominate you regardless of how many awards you have. Even though I don’t really have much of a farm, urban or otherwise, I love learning all the neat things you are experiencing. I hope to contribute a little to the traffic to your site. Any tips on building my first chicken coop the chicks are about 4-5 weeks…I live on a small lot in the city and have 6 chickies…. What does you coop look like? Just stumbled across your site! I’m a bit north & west of you in Petaluma. I look forward to reading more! Welcome! Now I’m off to go check out your blog! Wow, can I just live with you guys? Haha I’m jealous, you guys are living my dream. I’m stuck in an apartment for now, but looking for houses currently. Small house, big yard, good family, and great food. Keep it up!! How wonderful to find Dog Island Farm on the other side of the country! We are Dharma Dogs Farm – a little half acre homestead in Pennsylvania. We are just beginning to organize our website. Peace and Good Harvests to you! What a great overhead shot of your garden! I wish I had so much sun. Just found your website. Loved reading. Currently my sister and I live in northern Illinois, soon to move to the panhandle mountain area of Texas. 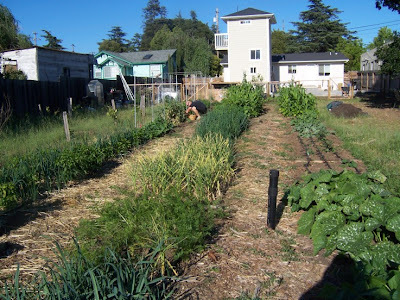 We are planning to purchase a modest home and enough land to have a really nice, large garden, maybe some chickens, just for the eggs and to debug the garden, and a few fruit trees. Am looking forward to reading about your experiences and picking up some tips on the adventure ahead of us. I admire your efforts to reverse the trend, especially in the proximity of a large city. I am L.A. based private health chef and work with the Learning Garden at Venice High School, to educate and connect the students to Mother Earth, so that they can see the dandelions growing through the cement cracks. Thank you for being part of the solution.